Indonesia's presidential candidate Joko Widodo laughs as his running mate for the upcoming election Ma'ruf Amin gestures at a carnival during his campaign rally in Tangerang, Banten province, Indonesia, April 7, 2019. Indonesia, the world’s third-biggest democracy, will hold presidential and parliamentary elections on April 17. Incumbent President Joko Widodo, known as Jokowi, will face ex-military man Prabowo Subianto, who was also his opposition in 2014. Opinion polls place Widodo in the lead by a double-digit margin. 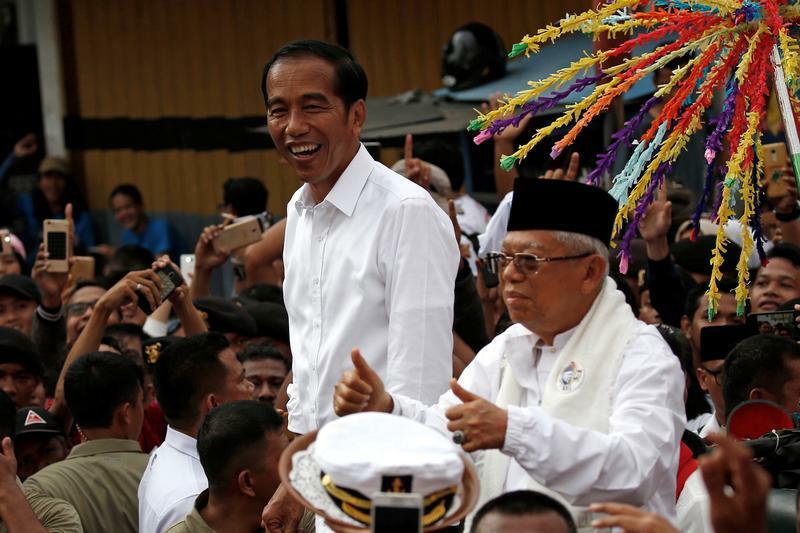 Results of a national survey published by Saiful Mujani Research and Consulting on March 17 put support for Jokowi was at just under 58 percent, compared to Prabowo at roughly 32 percent. Prabowo’s opposition camp said on April 1 that it had uncovered data irregularities in the electoral rolls affecting millions of people, and vowed to take legal action or use “people power” to tackle the issue.